The African migrant issue in Israel is one of those stories where the solution is relatively simple but the politics, fueled by misinformation, are devilishly complex. I composed the following myth and facts to educate myself. I am not an expert and all cited data comes from easily verifiable public sources—in places where I don’t know what data exists, I say so. 1. They came for jobs, not to escape persecution. That is, they are migrant workers, not refugees. Saying exactly who is and isn’t a refugee is currently not possible because Israel has so far not followed international law in assessing the migrants’ refugee status. The estimated 54,000 refugees are almost entirely Eritreans (36,000) and Sudanese (14,000). 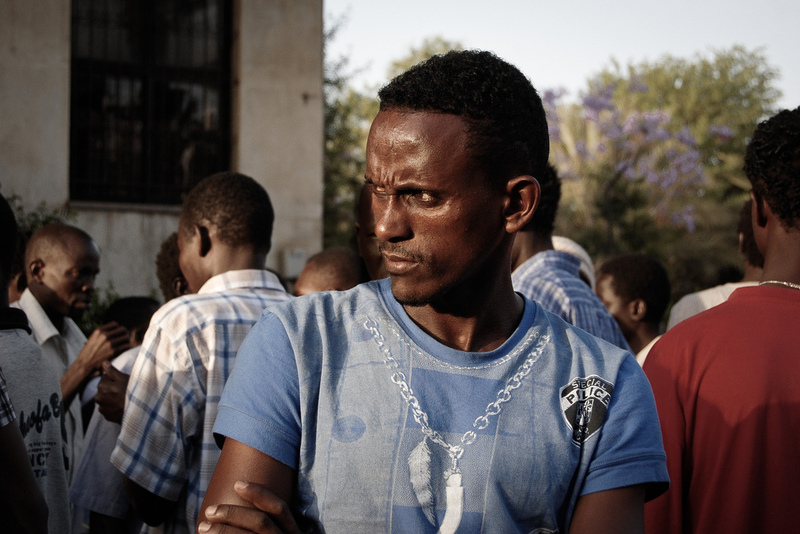 In other countries, more than 70% of Eritrean and Sudanese are recognized as refugees and granted asylum. Related: What to call the recently arrived African community in Israel is itself a matter of heated dispute. Infiltrators, illegal immigrants, migrant workers, asylum seekers and refugees are all thrown around with clear political agendas. African migrants is perhaps the most neutral term. 2. If we let them stay, millions more will come. Since Israel built a fence on its southern border, migrants have essentially stopped getting in. Here is how many got in per month in 2013: January – 10; February – 5; March – 3; April – 10; May – 2; June – 5; July – 1; August – 0; September – 0. In short, no matter what we do, nobody else is coming. 3. If we let them stay, they will erode Israel’s Jewish character. At 0.6% of Israel’s population (54,000 people), the African migrants will have little impact on Israel, especially if they are not concentrated in one underdeveloped neighborhood in South Tel Aviv. If allowed to stay, some may well embrace life in Israel—just as Russian and Ethiopian arrivals with tangential Jewish identity (not all Russian/Ethiopians have tangential Judaism, but some definitely do!) take great pride in being Israeli. Most will probably seek to move on, joining larger communities of their compatriots in other countries or returning to their families in Africa when they can. On a deeper level, this issue highlights one’s expectations for a Jewish State. Does it need to be a state of Jewish citizens (with a respected if not fully integrated non-Jewish minority)? Or should Jewish culture be the identity of the state, irrespective of who exactly lives there? The two issues are related, and yet distinct—each has its own complexities (Who is a Jew? What are Jewish values? Is Jewish culture static or dynamic?) These issues are all very exciting. But the only one that will be fundamentally affected by how we react to the African migrant community is our Jewish moral responsibility for caring for the stranger in our midst. 4. They have made southern Tel Aviv (where much of the African migrant community is concentrated) a poor, criminal, no-go neighborhood. I have not yet seen accurate data regarding what extent of crime in South Tel Aviv involves African migrants. Or what crime levels were like in South Tel Aviv before the African migrants arrived. Based on anecdotal reports, South Tel Aviv has been an underdeveloped, crime-ridden area with minimal government/police presence long before the African migrants arrived—which explains why the African migrants settled there to begin with. Obviously, adding tens of thousands of people that are not allowed to work into such a neighborhood only adds to the neighborhood’s poverty, crime and lack of basic resources. 5. Israel has no legal or moral responsibility to let them stay. Legally, Israel is bound by international laws that obligate assessing refugee claims and responding accordingly. Exactly how countries are asked to respond isn’t clear to me—seems that if someone is recognized as a refugee, then they are granted either citizenship or a work visa. And if they are not recognized as a refugee, they are considered illegal immigrants and are treated just like you or I would be treated if we arrived in a country without proper paperwork—sent packing! Morally, Israel is bound by basic values of caring for others that are fundamental to our Jewish tradition, as well as Israel’s own intimate history of providing refuge for a people fleeing persecution. If these values are unfamiliar, then what you should really be reading up on is your Judaism—Joseph Telushkin’s A Code of Jewish Ethics: Volume I and II are a great place to start. 6. Other countries can deal with them. Other countries do deal with refugees! Liberal democracies on average have far more asylum seekers than Israel—in most European countries, the percentage of refugees in the total population is more than double the 0.6% percentage of the total African migrant community in Israel (some of whom likely would be assessed as non-refugees and deported). Authoritarian countries like Egypt tend to shoot or persecute asylum seekers—hardly a role model for Israel (despite calls from certain right-wing Israeli politicians for Israel to act accordingly). 7. We have more pressing domestic issues to deal with and cannot waste money helping 50,000 African migrants, even if they are refugees. Plus, we already help out in Africa. Responding to the African migrants in line with legal and moral norms is more cost effective than the current policy. To wit: The Ministry of Finance estimates that Israel is losing 180 million NIS annually by not taxing and not allowing the African migrants to work in the countless basic services that seek workers. Then there are the half-billion shekels spent building and maintaining desert prisons for the African migrants. There is no evidence or logic to suggest that properly responding to the African migrants will negatively affect any other domestic issue in Israel. And Israel’s foreign aid in Africa does not excuse Israel from dealing effectively, legally and morally with local African migrants. 8. There’s not a better alternative to Bibi’s policy of building desert prisons. Yes, there is. Start assessing who is and is not a refugee in line with international norms. Those rejected are deported. Those accepted are granted work visas (or even citizenship?) and allowed to live normal lives here like anyone else with proper paperwork. Plus, the country can do more to provide equitable resources to underdeveloped areas like South Tel Aviv, while also encouraging refugees granted work visas to spread out and take advantage of job opportunities beyond the Tel Aviv area. Sam Chester is an expert on China-Middle East affairs and a graduate of the Paul H. Nitze School of Advanced International Studies at Johns Hopkins University. His regular commentary on Sino-Middle East issues can be found on Twitter @Shaihuludata. He lives in Israel. This post originally appeared as a Facebook note. 1)Look at a map. Israel does not share a border with any of the infiltrator’s home countries. They crossed the border from Egypt where, all though they were safe from harm, they couldn’t find work. They are all looking for work. 2) They are Moslems. Though it is not PC to say so, Moslem countries are decidedly anti-Israel. Why should we let our enemies into our country? Exactly. Let them stay in Egypt. They are asylum seekers; “African migrant”, though anodyne, is correct. And by crossing multiple international boundaries and entering surreptitiously without endeavouring in any way to obtain an entry visa, it is equally true that they are illegal. This definition does not, prima facie, match the situation of any of these Africans. Like most Africans, they live in nations in which there is no rule of law. Their desire to emigrate is understandable, but their status as non-refugees is clear to me. There is no “tendency to shoot” refugees in Egypt; it has happened, but there has never to my knowledge been an application for refugee status by these Africans in either Uganda, Ethiopia or Kenya (all far closer to Eritrea and Sudan) or Egypt or in Gaza. Interesting also why their Muslim cousins in the West Bank don’t offer any of them refuge. Mr. Chester certainly knows all this; is he simply pushing a “touchy feelie” leftist ideology to make a complex issue sound simple, and turn the issue into one of Israeli intransigence? The three comments above are informative for what they say about many of those that oppose dealing with the African migrants in a humane/legal/efficient manner. Namely, they rely on untruths and racist prejudice or make bizarre claims far removed from reality. The first two comments, by Carl and Jan, cite no facts while blatantly peddling untruths and sentiments that are not only racist but are simply dumb (“all Muslims are the enemy”). The comment by GeorgeAz disputes that refugees are shot in Egypt. Clearly, GeorgeAz has never spent time on the border with Egypt (as I did for over a year in the IDF) and witnessed Egyptian army shooting at refugees on many occasions. GeorgeAz also questions why refugees dont receive asylum in neighboring African countries, Gaza or the West Bank. Apparently, GeorgeAz does not realize that these countries are some of the poorest in the world, with recent or current violent conflicts of their own and are already overrun with refugees. One does not know whether to laugh or cry at the ludicrous suggestion that Gaza can provide refugees with a safe haven. What Mr. Chester knows is this — there is in fact a sane and straightforward solution that is not implemented for insane and convoluted political reasons. As an Israeli myself, it pains me deeply when my government acts so boorishly–and obligates me to call attention to their foolishness and ask for change.